What’s Senate Majority Leader Mike Shirkey’s message to state contractors regarding Gov. Gretchen Whitmer’s new equal pay directive? “Don’t worry about it,” the Clarklake Republican said in an interview with the Michigan Advance. 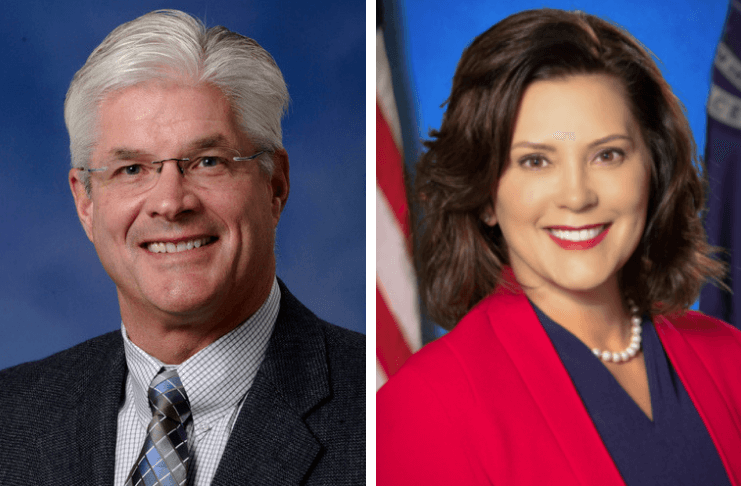 During a 20-minute interview last week in the new Senate majority leader’s Capitol office, Shirkey called Whitmer’s new executive directive to halt inquiries into applicants’ past salaries confusing and said current and would-be state contractors should ignore it. Shirkey also said he does not believe a pay gap exists between men and women in the first place. Shirkey, an engineer who owns a Jackson-based machine assembly plant called Orbitform, also said the question of an applicant’s prior salary doesn’t usually come up until a job offer is made anyway. On Tuesday, the newly inaugurated Whitmer, a Democrat, signed an executive directive she says is meant to ensure “equal pay for equal work.” It would stop state departments and agencies from asking about or investigating applicants’ prior salary. The pay gap is even wider for many women of color in Michigan. According to a 2017 report from the Washington, D.C.-based National Partnership for Women, Black women are paid 64 cents for every dollar paid to white, non-Hispanic men. Latinas are paid 57 cents and Asian women are paid 96 cents. According to a 2018 Pew Research Center analysis, the gender pay gap is narrowing but still exists. Pew cites an estimated 18-cent pay disparity, while Whitmer argued there is a 22-cent difference. In 1980, women ages 25 to 34 made about 33 cents less than their male counterparts, according to Pew. Other groups may differ slightly on their average pay gap estimates, but disparity is cited by the U.S. Bureau of Labor Statistics, the U.S. Department of Labor and American Bar Association and many other organizations. “In simple terms, no matter how you measure it, there is a gap,” according to the D.C.-based Economic Policy Institute, which describes itself as a nonpartisan, nonprofit think-tank. Factors such as educational attainment, occupational segregation and work experience often account for the gap, according to Pew. But gender discrimination may also play a role. It’s harder to prove and measure. The American Association of University Women, a D.C.-based group that describes itself as “the nation’s leading voice promoting equity and education for women and girls,” argues that salary history can be used to depress women’s wages. “Employer practices — such as using prior salary history in setting current pay and prohibiting employees from discussing their wages — compound the problem,” the group says. The group also cited a 22-cent gender pay gap in Michigan — higher than the Bureau of Labor Statistics’ national average estimate that women earn 83 percent of what men do. Equal pay initiatives have often enjoyed bipartisan support over the last few decades. However, there’s a growing group of Republicans who oppose such measures. U.S. Senate Republicans torpedoed the Paycheck Fairness Act in 2014. Republican leaders in the state House and Senate did not comment on Whitmer’s new order the day it was unveiled. But on Thursday, Shirkey told the Advance he’s skeptical of statistics meant to demonstrate the gender pay gap. Shirkey was elected to the state Senate in November 2014. He was a state representative from 2011 to 2015 during the time that Whitmer served as Senate minority leader. The Republican Senate leader said that more broadly, he believes Whitmer’s past directives in her first two weeks in office amount to statements of her philosophy, rather than binding new legal requirements. A spokeswoman for Whitmer, Tiffany Brown, did not respond to an inquiry from the Advance regarding Shirkey’s statements.